Bernard Rose followed his moody fantasy-thriller Paperhouse (1988) with this modern horror tale, based on Clive Barker's short story The Forbidden. Compiling a thesis on urban legends, University of Illinois in Chicago graduate student Helen Lyle (Virginia Madsen) becomes aware of the prevalent superstition surrounding the legend of Candyman (Tony Todd)--a hook-wielding phantom who will appear if his name is recited five times into a mirror--among the tenants of Chicago's Cabrini Green project. A senior professor, hearing of Helen's research, explains the historical basis for the legend, detailing how Candyman is believed to be the vengeful spirit of a former slave who, though initially respected in academia, was set upon and mutilated by an angry mob when accused of taking a white mistress. When the clinically-detached Helen flaunts her intellectual confidence by reciting Candyman's name five times, she sets in motion an inevitable series of supernatural events -- culminating in a series of grisly killings, after which Helen is invariably found holding the bloody murder weapon. 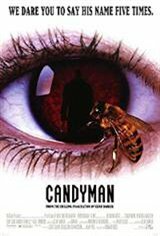 Though she is captured by the police, it becomes evident to Helen that Candyman is guiding her fate every step of the way.